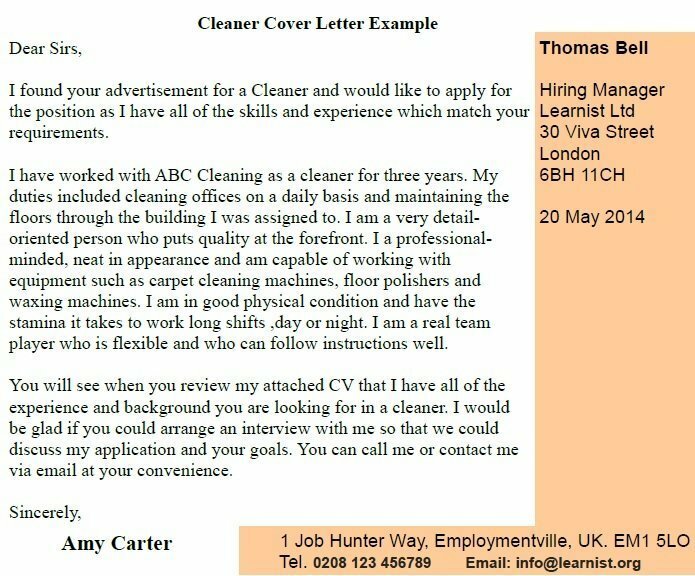 Cover letter example for a Cleaner job vacancy in the UK. Amend as suitable and start writing your covering letter in seconds. I found your advertisement for a Cleaner and would like to apply for the position as I have all of the skills and experience which match your requirements. I have worked with ABC Cleaning as a cleaner for three years. My duties included cleaning offices on a daily basis and maintaining the floors through the building I was assigned to. I am a very detail-oriented person who puts quality at the forefront. I a professional-minded, neat in appearance and am capable of working with equipment such as carpet cleaning machines, floor polishers and waxing machines. I am in good physical condition and have the stamina it takes to work long shifts ,day or night. I am a real team player who is flexible and who can follow instructions well. You will see when you review my attached CV that I have all of the experience and background you are looking for in a cleaner. I would be glad if you could arrange an interview with me so that we could discuss my application and your goals. You can call me or contact me via email at your convenience. I am writing with regards to the job vacancy that you advertised for a cleaner at the offices of Jones & Jones Solicitors. I have eight years experience cleaning various locations such as Welburn Primary School, St Peters Hospital and the Sunny Side Care Home. I am meticulous about cleanliness, I enjoy things being in order and put in their place. I do not enjoy working in a messy or dirty environment. I have over the years formed my own private routine and scheduling to be able to clean effectively and efficiently during the allotted time frames required. I work quietly, discreetly and quickly, ensuring that those around me are not disrupted during the time I am present and working. I do not agree to intensive manual labour such as heavy lifting of machinery or furniture during my normal routine. If this is required, I prefer advance notice as I may need assistance. Should you be interested in offering me this position, I am available at any time for a formal interview.